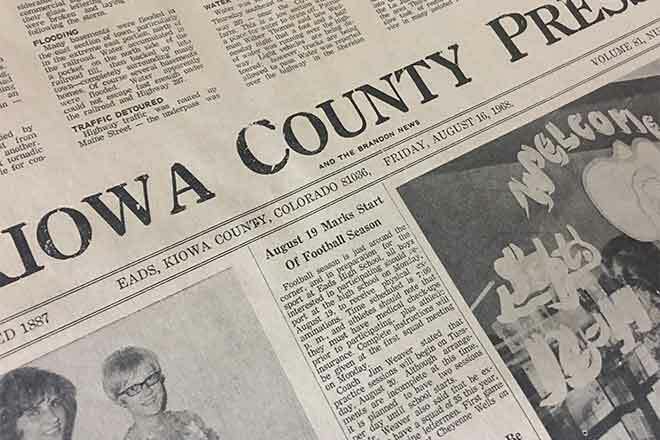 Towner Tales: There were quite a number of residents who traveled across state line to attend the Greeley County Fair. The U.S. Department of Agriculture official said Syracuse Sales Co., Inc., and its president have agreed to a suspension and cease and desists order. The Eads town board fired Police Chief and Deputy Chief and hired a new Chief in an action that may be illegal because it was taken during what the state attorney general office says was in effect an executive meeting. The Eads Chamber of Commerce has secured former Eads Singer Mike Franklin, a country rock star now from La Junta, for the Thursday night show at the Kiowa County Fair. A community recreational park in Eads complete with tennis courts, a new swimming pool, horseshoe pits, picnic tables, a playground open spaces & other advantages is the new goal of an ad hoc committee of residents. Mr. & Mrs. George Bickel of Haswell returned home after spending 3 months in Amsterdam Holland with their daughter and family, Paul Johnson. Sheridan Lake News: The varying amounts of rain we received are greatly appreciated. Reports anywhere from 1 to 2 inches. Traffic on US Highway 287 was halted as result of a flood that came down Rush Creek. As the flood receded, the debris and weeds that caught in the piling diverted the flow of the water until it was running from the north bank south parallel with the bridge instead of under it and soon cut the earth away until a large hole developed at the south approach. County Attorney James C. Lang has resigned as county attorney for Kiowa County and joined the National Guard. This is the first time for over 20 years that the county has been without a legal advisor. The new brick building belonging to J.W. Blair & H.V. Fluke is practically completed only a little "touching up" to be done. The 75 foot plate glass front makes quite a showing in our little city. J.W. Blair occupies the south room with a hardware store, and is open for business. The north room is to be occupied by the post office, with H.V. Fluke as Postmaster. The middle room is to be occupied by T.F. Prajer drug store, which is now located in the Nipps building (editor's note: now known as the Bransgrove building) A ten-foot cement sidewalk is being laid in front of the building.